Some history from the owner. When trials enthusiasts think about history of motorcycle trials, he thinks "Sammy Miller", and when you think Sammy Miller you think "ARIEL". 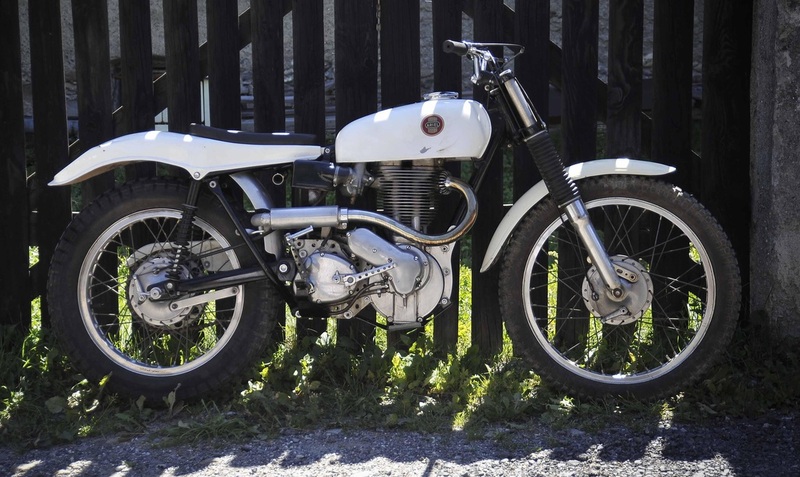 This motorcycle is such important ICON and milestone in trials. It really separates two ERAS of trials history, pre 65 and after. This is so, as genius of Sammy Miller has brought his ARIEL to apogeum of technical development,and than killed it with two stroke Bultaco Sherpa. Another incredible project that created another ICON of DESIGN. 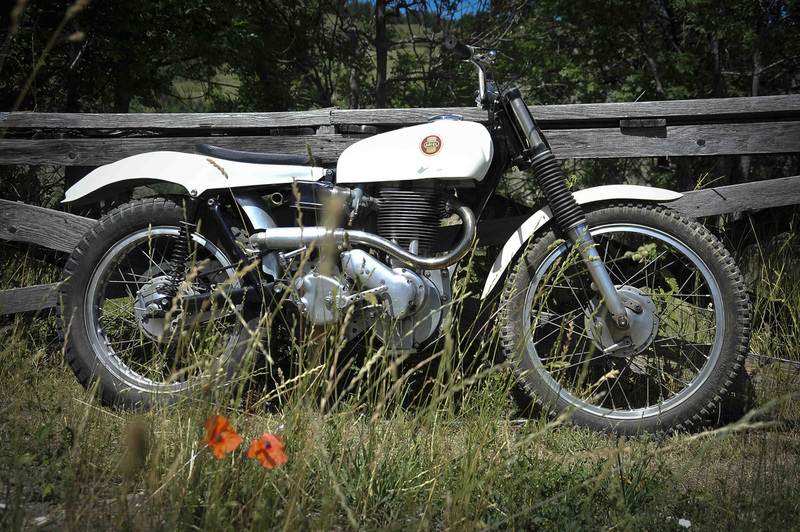 Coming back to ARIEL story, only two ORIGINAL bikes exist, they had registration numbers GOV 132 and second one has GON 786. Both were extensively used in competition by Sammy,even if more "famous" is GOV 132, which was more frequently used in trials and photographed,while it's twin brother GON 786 was kind of spare machine and source of spare parts as well, but was technically developed to identical level. So what has happened with these incredible machines when Sammy decided to face new challenge of designing new concept of trials bike for BULTACO ? Sammy has bought both bikes when he left ARIEL in 1965 and year later sold both to UK Bultaco distributor and trials bikes specialist COMERFORDS,who put both bikes "for sale" with price tag £ 425 for GOV 132 and £ 350 for GON 786 as it was less famous despite represented same level of technical development.In 1970 GOV 132 was bought by famous trials journalist and expert RALPH VENABLES, who asked Sammy to put it into perfect condition and than gave it as gift to National Motor Museum at Beaulieu with one restriction it must not be ever sold out of Great Britain !In about 1983 Sammy starts riding in pre 65 trials on exact copy of GOV 132,which he has build from spares, and which now you can admire in his Sammy Miller Museum in New Milton,Hants. But what has happened to other ARIEL GON 786 ? When Ariels were put "for sale" by Comerfords, one of Comerfords employee JOCK WILSON was already dreaming about buying this bike. Well GOV 132 was very expensive so his eye was on GON 786 still expensive at £ 350 (brand new Greeves trials costed £ 207 at that time...) yer more affordable. However in February 1965 GON 786 was sold to Arthur Fowler sidecar trials rider who anyway didn't convert bike to sidecar outfit, but lended it to Jock Wilson who used it successfully in trials. At the end of this year Fowler put GON 786 back to Comerfords for sale and this time Jock has realized his dream and bought it. Jock has used bike in many trials including Scottish in 1967 with good result, winning sub 500 class. Than he sold GON 786 to another rider HARRY RAYNER who used it for 18 months but without much success and he decided to sell it to another rider John Parry who after more or less same period decide to sell it and GON 786 comes back into hands of JOCK. Bike is well battered and Jock restores it to perfection and keeps it not using in competition. Many have tried to buy it from Jock, but he was reluctant to sell it, until 1988 when bike changed hands and was acquired by ERNIE PAGE. He bought it because of his passion for trials, to exhibit it as an art piece on some occasions and for his son trials rider. But time passes and changes everything and bike is for sale again and it' s XXI st century now. 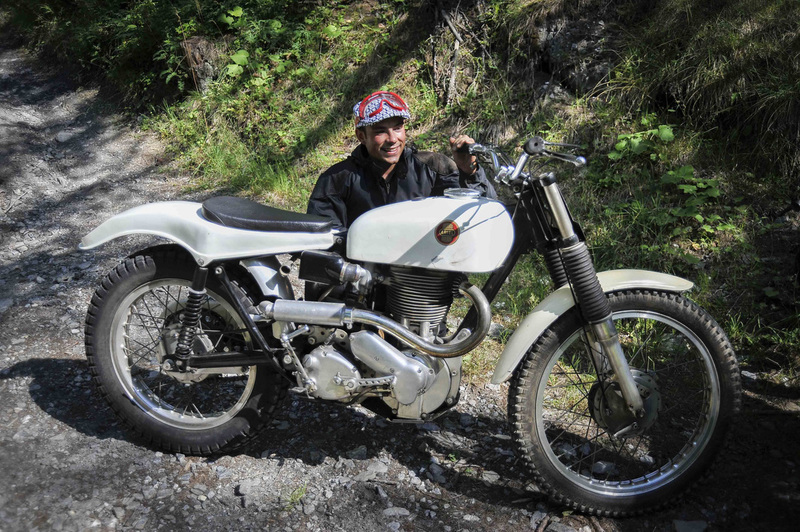 News that it' s for sale arrives to Italian trials enthusiast and lover of trials bikes Carlo Ramella who first doesn't want to believe it, and after double verification,immediately and spontaneously decide to buy it ! Now it' s his ! We have common Friend PIPPO BARTORILLA, excellent rials rider himself, so we asked if Carlo could show us GON 786 and take some photos. Not only he has agreed, but he also offered our ride on this piece or art .And that is how we came to visit his mountain chalet in Alps where we could take photos and enjoyed ride of this legendary bike. Here is list of most important to be illustrated with photos of details of this bike that I have sent earlier. 2/. Fuel tank: Beautifully styled, in fiberglass, very light and slim design, one bolt mounting, with depression in front part to allow full lock of steering with front fork coming close to tank. Perfectly done by BUTLER MOULDED LAMINATES,creation of Chris Butler also trials bike builder of "Butler" super light trials bike. with metal logo on top of tank real work of art. 3/. Seat base integrated with rear mudguard,another artwork in fiberglass by Butler, very slim in top view in cream white so synonymous with Miller's ARIEL ! It also had INTEGRATED registration number plate ! Seat perfectly designed light and slim yet comfortable ! 4/. Exhaust system: starting with beautiful curve, extremely compact and well tucked to bike, terminating with small silencer breathing hot exhoust gasses directly on rear tire knobs.This genius idea allowed cleaning rear tire from mud and also heat up tires rubber for better grip. 6/. Speedometer mounted on top of engine carter and protected by aluminium shield from mud etc. Not the easiest way to look at, speed but who does it in SLOWEST of all motorcycle sports ! 8/. Superlight fiberglass front mudguard,minimal and beautifully shaped yet very effficient and in perfect estetical harmony with fuel tank and seat base rear mudguard combination creating unforgettable aesthetics of this bike. All together one must appraise GENIUS of Sammy Miller and bike is a milestone in design. If I would have ever written book about influence of BAUHAUS design philosophy of "LESS IS MORE" I would have certainly included photo of this bike !